There is a quality of "bear-baiting" to the coverage of Toronto's self-destructive mayor, Rob Ford. For the past week, one gasp-inducing revelation about Ford has been followed by an impromptu news conference where a contrite and abashed Rob Ford apologizes, then flees to his office followed by a howl of questions from reporters and the buzz of camera shutters. This is followed at the end of the day by Ford speeding out of the underground garage, chased up the ramp by photographers and reporters yelling questions. Psychologists and addiction counsellors have taken over the Toronto media, giving opinions based on a distant observation of the mayor, who refuses (along with his family) to acknowledge that he has a problem. What about fairness when reporting on an elected official who shows signs of mental distress? Journalists are - for the most part - generalists. They rely on experts to provide context for stories that are beyond their experience or knowledge. Rob Ford's journalistically rich behaviour has always been bizarre, by any standard of what constitutes "normal" political behaviour. Past practice has been for journalists to ignore and sometimes collude in any "acting out" by public figures. But Ford has gone beyond that. As such, he has become a frenzied pursuit for journalists. Speaking of media frenzy, the Toronto Star admits it paid $5000 for the latest Ford video. This now puts the story into the dubious realm of "checkbook journalism." The Star was unwilling to pay $100,000 for the crack cocaine video. The police were eventually able to obtain it and admit it into evidence. At the time, the Star said it wouldn't engage in "checkbook journalism." But if the price is right, apparently, it's ok to do so. Ford has also been provocative with the media who now frequently adopt the role of amateur psychologist. Ford has an explosive temper and the media know precisely how to goad him into gaffes. If Ford is as unbalanced as experts tell us he is, the coverage often feels more like a stick poked into a wasp's nest, with predictable results. 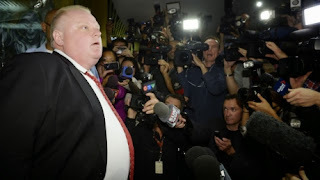 Can journalists balance the need to report on an odd elected official who may be mentally ill, with the obligation to treat Rob Ford as a suffering human being? This story continues to play itself out with more to come. (Note to journalists: you can stop describing each revelation as a "bombshell" now). But watching Ford crumple a bit more daily, it is painful to watch. Like the youtube video of car crashes in Russia, you just can't take your eyes off the spectacle. Even if you know how it will end. Thank you. The approach to Rob Ford by the media is twice an outrage. Once, to the man; once, to good name of the media. I am really not comfortable with the suggestion that because Rob Ford is a "suffering human being" with an "explosive temper", journalists owe him gentler treatment. He is a public figure who insists on continuing to be a public figure. He insists on continuing to represent Torontonians and spend our money, despite his admitted crimes and his grossly unprofessional behaviour. This post seems to suggest that he should be given a pass on his grossly unprofessional behaviour because of his other grossly unprofessional behaviour ("explosive temper", i.e. tendency to yell and scream at people). He gets angry and abusive when asked legitimate questions about his behaviour -- so what? They ARE legitimate questions. As a citizen of Toronto, I want to know if I'm paying this man, who deliberately made himself a public figure, to commit crimes. I have a legitimate interest in knowing that. Rob Ford the suffering human being is much less important than Rob Ford the criminal who is holding Toronto hostage. Until the latter is gone, I do not care about the former. I agree with you. Thank you for saying this, as it needed to be said.